We join Ian on a trip home one foggy night. Coming back from a job interview, he has never even seen Barbara Wright until he comes across her in a car crash. We, Doctor Who fans, know that in the opening episode of An Unearthly Child that Barbara and Susan weren't caught in a car crash and it is a pretty grim way of opening a Doctor Who target novelisation, something which were designed for children. With the worry that the cars will go up in flames, the ordinary neatly transitions into the extraordinary when we see Ian's worries turn from unemployment to a serious matter of life and death. It is in the wake of the crash that we first encounter the Doctor. He is the true 'Doctor Who', the man who is mysterious and unpredictably completely at ease with getting other people into harms way so long as he gets his own way. In this novel he is depicted even more devious than he is in the television serial and we see just how devious through the eyes of Ian as the story unfolds. The entire book is told through the eyes of Ian which may seem like a bad idea at first. After all, a lot of the best things in The Daleks happened when Ian wasn't around, here we don't get to read about the Dalek sucker menacing Barbara. But as the book unfolds it completely works as, lets face it, there is a lot about The Daleks that just drags. And seeing events trough the eyes of Ian is a refreshing move that leads to a fast paced novel. As the action shifts between the heart of the Dalek city to the outskirts of the desert wasteland inhabited by the Thals, we get to learn more about Ian who, in the television series was supposed to be the action hero. But what is a shame is that characters like Barbara and Susan don't get a lot of time in this novel, with the exception of the end which centres around Barbara. What is also surprising about the book is the relationship between Ian and Barbara, they come across more as the two people thrown together that were meant to come across as in the television serial and they spend most of their time bickering. To the audience in those early 1960's adventures, they weren't supposed to sure about just who the Doctor was. Was he the hero? Or was he destined to be a bad guy? Never more so has that been on display than here and through Ian's eyes we see those two polar opposite characteristics almost at war with each other. And of course, what makes this book so iconic is the stunning artwork on the cover created by Chris Achilleos who centres the Doctor right in the middle. Reading the book, it seems strange to have the Doctor and not Ian but I suppose had it been Ian in the middle no one would have known what they were buying! 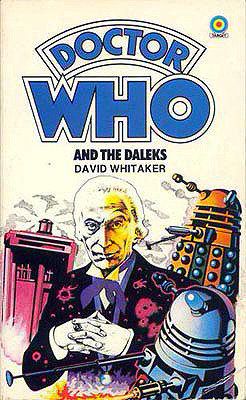 The Doctor is surrounded by two Daleks and the TARDIS or, as it is displayed in this novel The Tardis. It is such an iconic piece of Doctor Who artwork that we can often forget just how well designed it is. It really exudes an otherworldliness with the Doctor, his mysterious flying box and is battles with villains who spit fire from their guns. Also inside the book, their are some great illustrations that may seem out of place to begin with but gradually they get more in tune with the book. Artist Arnold Schwartzman really makes the characters recognizable and does surprisingly good Daleks! Now with it having been reprinted for modern audiences to enjoy never more has it been a book that every Doctor Who fan needs on their shelves!